The powerful dragon is depicted with the four scholastic objects for success and skill. Feng Shui carps are popular symbols for strength and perseverance – they are rumored to can transform into the mystical dragon. 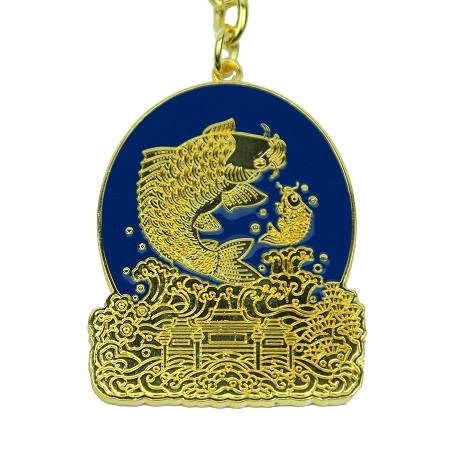 Carp statues and keychains are used to enhance educational luck, career luck, prosperity lucky, and success in all scholastic pursuits. Dragons are one of the most auspicious animals and represent strength, good fortune, and power. This lovely keychain is perfect for enhancing concentration, intellect, and skill for success in scholastic luck and educational endeavors. The keychain has the special ability to attract good fortune when taking exams, and enables a successful education and career for young children and adults alike. This keychain is highly recommended for anyone who is looking to achieve success educationally or career wise. Those whose horoscope sign,or room doors are affected by the #4 Academic Star are highly advised this keychain for good fortune. 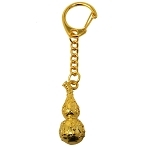 The dimension of the feng shui Education and Scholastic amulet keychain is approx. 4.5" x 1.5" x 1/8". It is made of alloy.